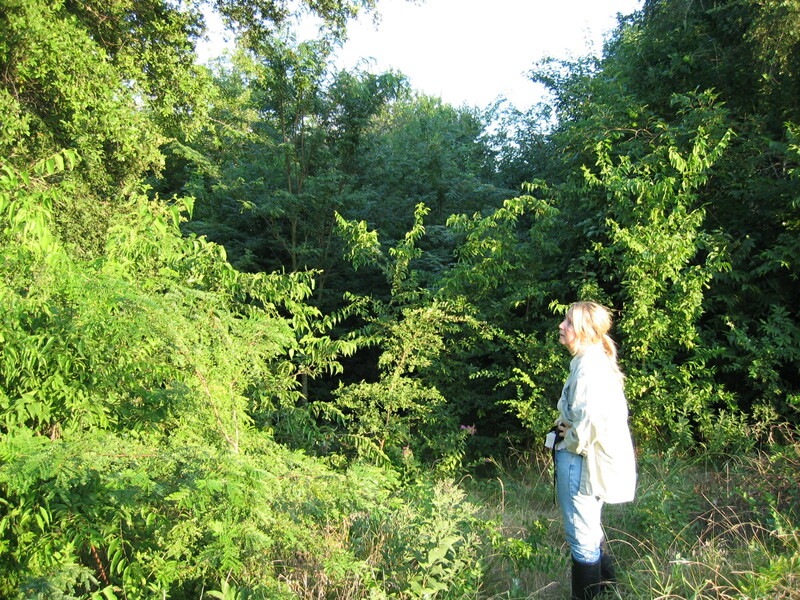 Green Source DFW reporter Amy Martin peruses the prairie remnant at Chisholm Trail Community Park in Fort Worth. Photo by Scooter Smith. Fort Worth has been called the Queen of the Western Prairie. That makes Chisholm Trail Community Park’s prairie its crown jewel. Tandy Hills Natural Area is a gem for sure, but Chisholm Trail with its sweeping vistas captures the Cowtown history and western vibe. As the population of southwest Fort Worth boomed, Chisholm Trail Community Center and surrounding 84-acre park were created in 2014, carved from one of the last remaining significant swaths of Fort Worth Prairie ecosystem. 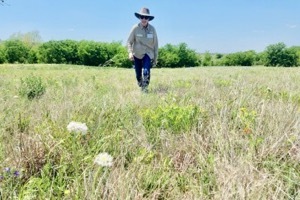 “Someone in the parks department realized it was still a good piece of prairie,” said Michelle Villafranca, natural resource specialist at the Fort Worth Nature Center and Refuge. Prairie remnant at the park in the foreground is contrasted by the mowed soccer field beyond. Courtesy of Amy Martin and Scooter Smith. She credited landscape architect Tom Alves’ efforts. 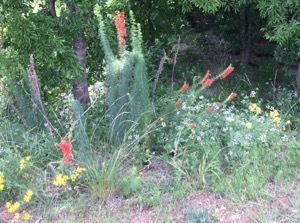 Villafranca described a native plant rescue prior to soccer-fields construction. 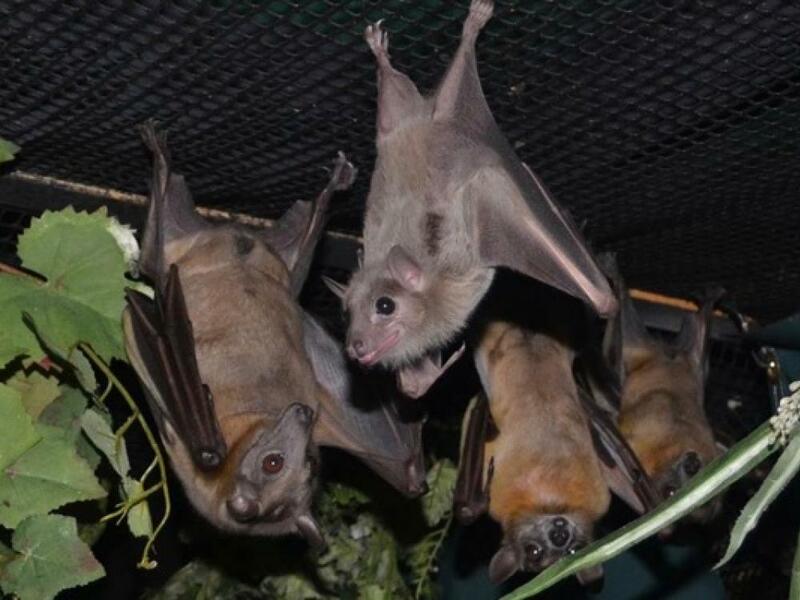 Dug-up plants were stabilized and nurtured at the Fort Worth Botanic Garden greenhouse. 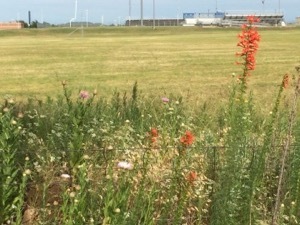 After development of a skateboard park and other amenities and infrastructure, the shepherded plants were returned to the prairie. Most of the park’s development lies at the south end, leaving the northern terrain relatively unperturbed. A one-mile concrete trail loops the prairie and winds around a sanguine pond. Villafranca related that the route was chosen to minimize ecological damage. On the late spring afternoon of my visit, we amble the Chisholm Trail Prairie trail after a theater matinee, appreciating the chigger-free opportunity (if you stay on the trail) to get beautifully close and personal with a prairie. A slightly stormy sky that creates a shifting array of light and a feisty breeze carries the sounds of nearby skateboarders across the slopes. The gentle multi-hued nuance of a prairie in spring spreads out before us. American basket flowers in bloom. Courtesy of Amy Martin and Scooter Smith. This week, the meadow’s theme is the modest prairie bishop’s (bifora americana) delicate white umbels created from a half-dozen teeny flowers. Small prairie verbena (glandularia bipinnatifida) poke their ornately lobed leaves and assertive purple umbels about the expanse. Engelmann daisy (engelmannia peristenia) contribute their intense yellow. Pale-leaf yucca’s (yucca pallida) vertical bloom stalks may be past their prime, but the outrageously tall standing cypress (ipomopsis rubra) is in full force. The four-foot spikes of green leafy fluff terminate into six-inches or more of tubular cardinal blooms. Standing cypress dot the landscape. Courtesy of Amy Martin and Scooter Smith. Large swaths of American basket-flower (centaurea americana) in flower are a breathtaking dazzle of magenta. The insane amount of bees and beetles they attract is irresistible, luring me off the trail (and right through a chigger patch, I later learn). The yellow-tipped orange fervor of Indian blanket (gaillardia pulchella) coats a sunny hillside. The riotous diversity of Chisholm Trail Prairie arises from its location atop staggered layers of Cretaceous limestone bench topography. Seeps from the rocky layers form fertile micro-habitats that foster plants and wildlife well into the summer. The seeps feed a pond that is kept stocked for fisherman. Plants bedecked with damselflies ring the shore. Flotillas of ridiculously happy frogfruit (phyla nodiflora) spread into the pond, its tiny corn-cob buds topped with rings of startlingly white flowers. Delicate white blooms of water willow (justicia americana) float in the shallows. 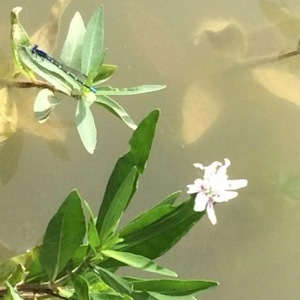 A damselfly and water willow on the pond. The varied routes of the Chisholm Trail spanned from Mexico to Kansas, with this one skirting the edge of the Western Cross Timbers. A windmill in the park parking lot evokes a time when ranch cattle grazed on native grasses. Now it’s a prairie for all of us. Chisholm Trail Prairie is a hotbed of naturalist activity. 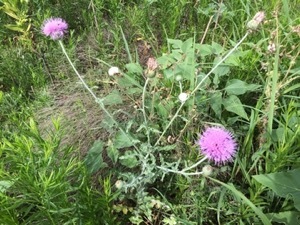 Exploratory hikes have been hosted by members of the Fort Worth chapters of Native Prairies Association of Texas, Native Plant Society of Texas and Texas Master Naturalists, plus staff from the Fort Worth Nature Center and Refuge. 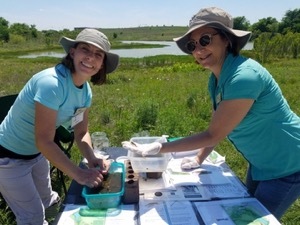 Master Naturalists Mindy Crudup and Layne Calabro run the Aquatic station during the spring Talk with a Naturalist event at Chisholm Trail Community Park. Courtesy of Michelle Villafranca. Kerry Newberry organized the Chisholm Trail Community Park docents training and Talk with a Naturalist events at the spring iNaturalist City Nature Challenge. 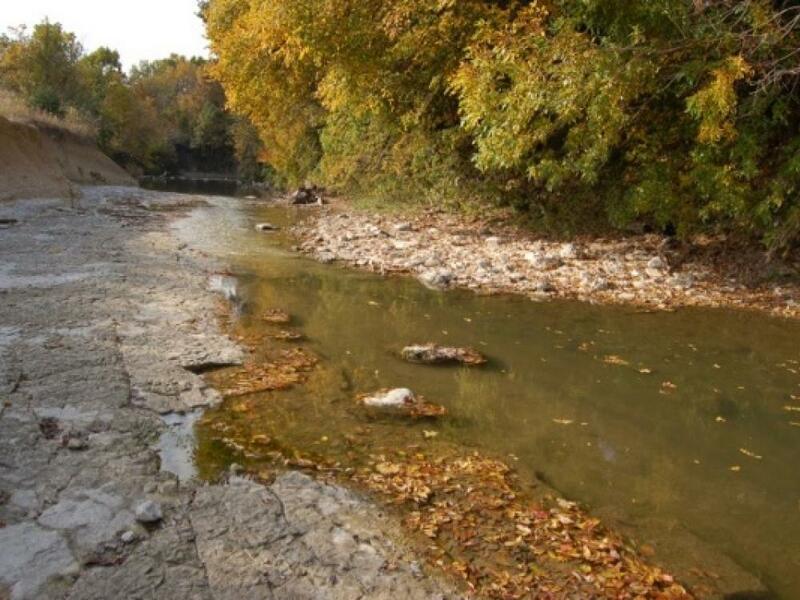 Those volunteers will be hosting hikes the last three Saturdays of September. An April 2018 BioBlitz boasted robust participation, as did a spring iNaturalist identification hike with Sam Kieschnick, urban wildlife biologist with the Texas Parks and Wildlife Department. Even deaf students from adjacent North Crowley High School have gotten into the naturalist act. It’s all matched by the community center’s commitment. Tiara Chapman, former recreation assistant for Fort Worth Park and Recreation, led outdoor adventure programs, taking a creative approach such as native plant scavenger hunts. Upcoming park improvements include interpretive naturalist signs and public art projects that pay tribute to the ecosystem and history. 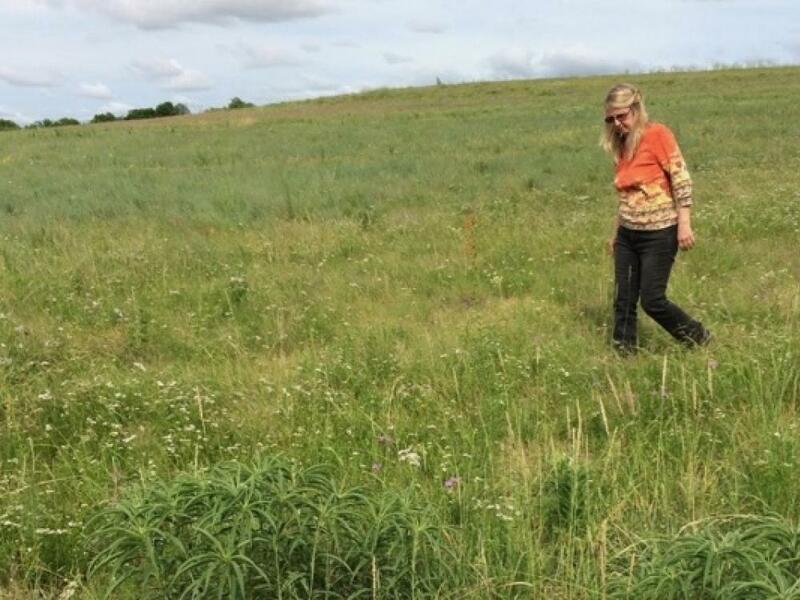 Master naturalist Judy Sheridan walks across the prairie to look at a Barbara’s button. Courtesy of Michelle Villafranca. But this piece of prairie heaven may be under siege again if a 2018 bond package passes. Funds would then be available for another soccer field and other amenities, much of it built on top of the rare prairie. North Texas Wild is an ongoing column by Amy Martin covering the wild spaces of North Texas.